Hi everyone! 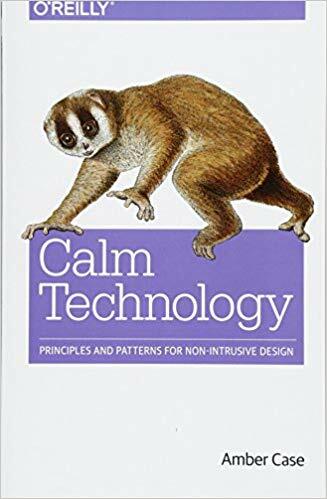 It’s been a big year for Calm Technology: Principles and Patterns for Non-Intrusive Design. I’ve been working with sound designer Aaron Day on a semi-sequel to it called Designing Products with Sound: Principles and Patterns for Mixed Environments that should be out in October. I’ve also been spending a lot of time in Boston, MA at Harvard’s Berkman Klein Center for Internet & Society researching the intersection of technology and humans. Here’s my book tour schedule for the next couple of months. I’m looking forward to meeting lots of new people! 4-5: Keynote on Calm Technology. IFA+Summit. Berlin, Germany. 7: Keynote on Calm Technology. 67th International Retail Summit. Zurich, Switzerland. 8: Keynote at Mind the Product. London, UK. 8-11: Free time in London, England. 13: World 50 Conference. NYC, NY. 14: Keynote on Calm Technology. Waterloo Innovation Summit. Waterloo, Canada. 26-29: Conference on the future of AI. Juvet Landscape Hotel, Norway. 2-3: Foresight and Trends. Home Studios, New York, NY. 4-5: Fedex Security Awareness (internal event). Memphis, TN. 16-20: SIBOS. Financial Security and Calm Technology. Toronto, ONT. 18: World 50 Conference, NY, NY. 26-28: Northern User Experience. Manchester, England. Thanks so much for all of your support over these last few years. Here’s to the future!